The Triarchy Technologies VSA6G2A Vector Spectrum Analyzer is an economical tool that plugs into the USB port of a PC and is controlled with the provided PC application software. It offers almost all the functionality of a benchtop spectrum analyzer. Its frequency range of operation is from 100 Hz to 6.2 GHz, with an amplitude measurement range of -140 dBm to 24 dBm. The RBW (resolution bandwidth) range is from 0.2 Hz to 10 MHz and the noise level (DANL) is as low as -140 dBm. The VSA6G2A is compact (4x1x1 in.) and easy to use. 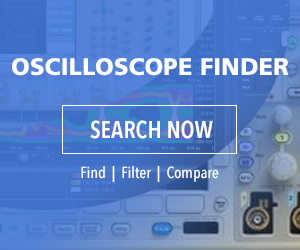 The software user interface has been designed to resemble the front panel of a standard desktop spectrum analyzer, allowing users to use the application intuitively without a steep learning curve. Touch screen support is also provided, making the VSA6G2A quick to operate. The VSA6G2A demodulation capabilities allow it to measure analog and digitally modulated signals, such as AM, FM, PM, MSK, and QPSK. Additionally, the VSA6G2A has I and Q signal ports, enabling it to work as a wide-band I/Q receiver platform. Visualizing pulse modulated signals is usually not very easy, but with the VSA6G2A’s trigger input it is straightforward to view these waveforms. The analyzer’s operation is divided into two bands to cover the complete operating range: a low band (100 Hz to 2 MHz) and a high band (1 MHz to 6.2 GHz). The VSA6G2A offers an N (female) RF signal input connector and a mini-B USB connector for interfacing with the PC. Four MMCX connectors provide I/Q port access. Weighing only 3.5 oz. and powered from a PC USB port, the VSA6G2A is a candidate for field test and installation because it can easily slip into a laptop bag and be used for monitoring RF signals in temperatures from -10 to +50°C. It is also suitable for use in benchtop EMC testing with near-field antennas. Made by Triarchy Technologies Corp., an innovative Canadian RF design house, the VSA6G2A Vector Spectrum Analyzer is available now at $950 from Saelig Co., Inc. Fairport, N.Y., Triarchy’s authorized US distributor. For detailed specifications, free technical assistance, or additional information, contact Saelig at 1-888-7SAELIG, via email: info@saelig.com, or visit http://www.saelig.com/category/MFR00149.htm.